TruLaw is not currently accepting new Mirena cases due to the uncertainty of the litigation. December 2018 – The majority of the Mirena cases have been filed under an order of consolidation in the Southern District of New York City under Judge Paul A. Engelmayer. Due to recent rulings by Judge Engelmayer, we are currently unsure if these cases will be able to move forward and are unable to accept new clients at this time. We will update this page and our clients when we are certain about the future for the Mirena litigation. In October 2018, Judge Engelmayer ruled to exclude plaintiff’s scientific evidence that Mirena was the cause of injuries claimed by our clients. In essence, Judge Engelmayer made a ruling showing that he does not believe our experts. We strongly disagree with this ruling and our Mirena lawyers are working to reverse this decision. If plaintiffs are unable to reverse this decision, we will need to reconsider a path forward for our current clients. Studies find a higher than expected number of brain injuries reported to the FDA with Mirena use, prompting hundreds of women to reach out to lawyers to file Mirena brain injury lawsuits. According to an April 2017 study, Mirena users were over seven times more likely to develop intracranial hypertension or Pseudotumor cerebri (PTC) than other levonorgestrel intrauterine systems. Mirena is a small T-shaped plastic device inserted into the uterus that releases levonorgestrel, an artificial form of the hormone progestin. Levonorgestrel is a female hormone that can cause changes in the cervix, making it harder for sperm to reach the uterus and harder for a fertilized egg to attach to the uterus. A levonorgestrel intrauterine system is a plastic device that is placed in the uterus where it slowly releases the hormone to prevent pregnancy for 3 to 5 years. The Mirena IUD contains 52 mg of levonorgestrel and initially the hormone is releasted at a rate of approximately 20 mcg/day. This rate then decreases to half that value after 5 years. According to Mirena’s prescribing information, the device must be removed by the end of the 5th year. It can be repoaced at the time of the removal with a new device if you want to continue with this contraceptive method. Mirena is a small T-shaped plastic device inserted into the uterus that releases levonorgestrel, an artificial form of the hormone progestin. Bayer touts Mirena as “safe and effective” and “well-tolerated by patients” but, in fact, since January 1, 2004 (oldest data available in FDA database), the FDA has received 76,840 adverse event reports related to the Mirena product. 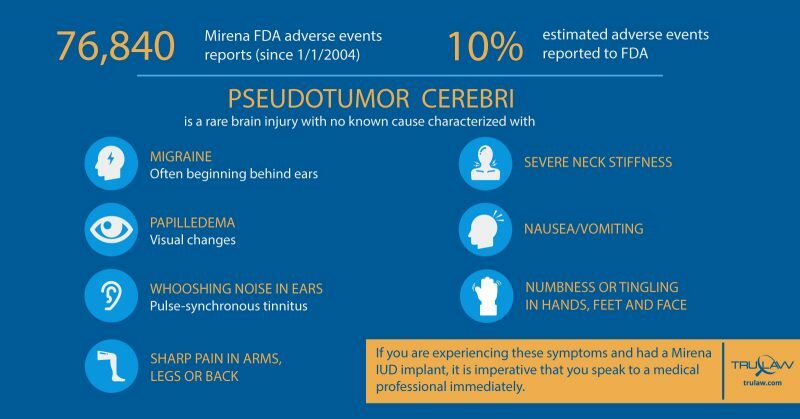 The number of Mirena injuries is likely closer to 700,000 since only about ten percent of all adverse events are actually reported to the FDA. What Is Idiopathic Intracranial Hypertension Or Pseudotumor Cerebri (PTC)? Pseudotumor cerebral (PTC) is a syndrome of intracranial hypertension that is idiopathic or from an identified secondary cause. Idiopathic means a disease that arises spontaneously or with no known cause, as opposed to an identified secondary cause bleeding in the skull or a known event that impacted the brain. PTC or Idiopathic Intracranial Hypertension (IIH) is generally characterized by headaches and visual loss that may be severe and permanent. IIH affects individuals differently but most women complain of the severe headaches, visual changes, and whooshing noise. If you are experiencing these symptoms and had a Mirena IUD implant, it is imperative that you speak to a medical professional immediately. An Intracranial Hypertension diagnosis (or Pseudotumor cerebri diagnosis) is generally diagnosed as a last resort when doctors can’t find another reason for a series of symptoms in the brain, ears, and eyes. Some women may ignore the signs for months and consider the symptoms an extreme form of menstrual cycle pain. But, women of childbearing age with a Mirena IUD, need to be aware of these symptoms and seek a medical professional as soon as possible. In addition to your medical provider, a diagnosis with IID or pseudotumor cerebri may require two additional medical professionals – a neurologist who will analyze your nervous system and spinal cord and an ophthalmologist to analyze eye problems. Diagnosis with IIH may require an MRI to review changes in the optic nerve. While PTC generally occurs in obese women of childbearing age, studies now show that women taking Mirena are over seven times more likely to develop IIH/PTC than other levonorgestrel intrauterine systems such as Skyla, Liletta or Kyleena. Furthermore, given that levonorgestrel blood levels in women on intrauterine levonorgestrel can fluctuate at times, it is biologically plausible for a woman on Mirena to experience intracranial hypertension after only a few months of use. Over one hundred lawsuits have been filed against Bayer alleging that the hormonal component in Mirena caused intracranial hypertension. Since this general causation issue is similar in all cases, on April 6, 2017, the Federal Panel on Multidistrict Litigation granted a petition to “centralize” all of the intracranial hypertension lawsuits into a single federal court. In re: Mirena IUS Levonorgestrel-Related Products Liability Litigation will be heard in from of the Honorable Paul A. Engelmayer in the Southern District of New York. This MDL will help facilitate efficient discovery conduct and move the cases forward towards a timelier resolution. The Mirena Intracranial Hypertension MDL is new, so as of today, none of these cases have proceeded to a jury and there have been no reported settlements of cases, yet. However, we believe the link between IIH and Mirena is strong and the cases that proceed through the courts will be successful. It is quite likely that settlement discussions will occur at some point. Mirena settlements would need to provide adequate compensation for the harm done to women. These settlements would be confidential and are determined by a number of factors, including the extent of the injury and the strength of the case. Nuero-Opthamology publishes a review that shows Mirena users are over 7 times as likely to develop pseudotumor cerebri.